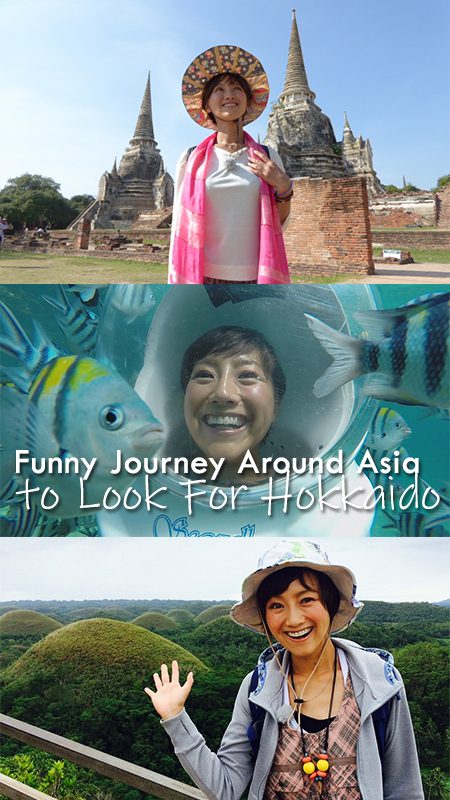 Overseas travel show featuring Wacky, a popular comedian, Wakana Fukushima, a TV personality, Angela Sato, a food fighter, and Akogare Kanai, HBC anchor. These four appears as a reporter or an “explorer,” series by series. In each series, the explorer visits a country in Asia with an assignment looking for something related to Hokkaido. Each series are consisted with four to seven episodes. Viewers will enjoy the explorer’s unexpected findings in destination countries, such as Hokkaido Ramen, Karate, used clothes from Hokkaido, students learned in Hokkaido, people who live there from Hokkaido, etc. The program also shows famous tourist attractions in each country. This must be interesting for foreign viewers to watch how countries in Asia are filmed by Japanese. The series covered 13 countries and regions, Singapore, Malaysia, Thailand, Taiwan, Philippines, Hong Kong, Nepal, Vietnam, Korea, Cambodia, Indonesia, Macau, and Sri Lanka.